Lamb is just divine when simply roasted with garlic and rosemary – a classic marriage. But lamb is so versatile and pairs very well with strong flavours and marinades. As with most meats, some cuts are best slow cooked and others roasted in the traditional fashion. Ideal if you want a simple, lean roast lamb that’s crisp on the outside and pink and juicy in the middle. 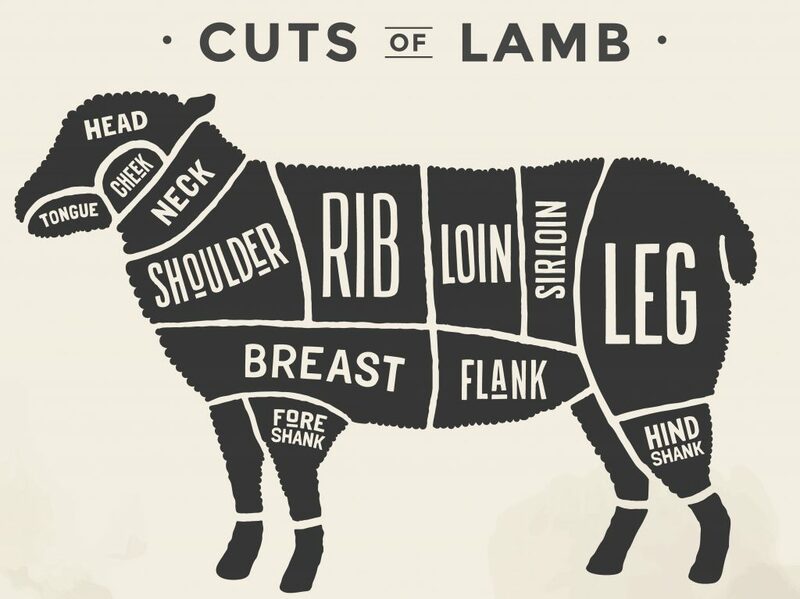 We offer a range of lamb joints – whole and half leg joints with the bone-in or a boneless leg rolled. A whole leg makes an impressive centrepiece and retains flavour from the bones – however a boneless leg is easier to carve. 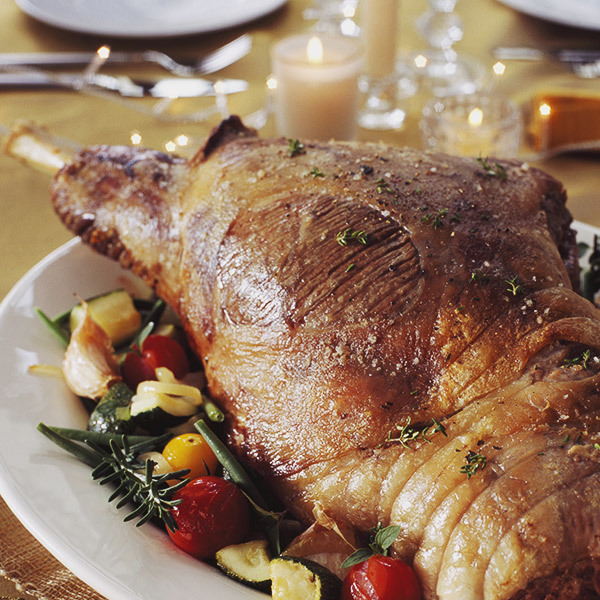 A whole leg of lamb usually weighs between 2 – 2.75kg and will serve 6-8 people. If you’re cooking for a smaller group, a half leg is a good option. This a is a fattier joint of meat and work really well when slow roasted at a lower temperature. It’s full of flavour and the slow roasting helps to produces a really tender result. We offer a whole shoulder, half shoulder blade, half shoulder knuckle or a boned and roller shoulder. Racks and fillets are ideal is you are cooking for a few people. A Rack of lamb or lamb fillet make a quick roast for 2 people with no waste. They both benefit from pan frying first until browned to seal them as they’re leaner and the roasting time is shorter. Lamb is a sweet but robust meat, there are many ways you can add and enhance the flavour when roasting your lamb. The classic rosemary and garlic is a popular one all-round. Simply make several small incisions with a small knife in the meat, (don’t cut too deeply), push thin pieces of garlic and a small sprig of rosemary into each incision. As the lamb cooks, the rosemary and garlic will impart a wonderful flavour into the meat. Delicious. By marinating lamb you can add a great deal of depth to the meat. Try a combo of red wine and garlic or yogurt and turmeric for something a little different or for a Mediterranean feel, Combine garlic, tomato paste, oil, oregano and red wine. It’s important to take large joints of meat out of the fridge about an hour before you want to cook it. This allows the meat to come to room temperature and it should cook more evenly. 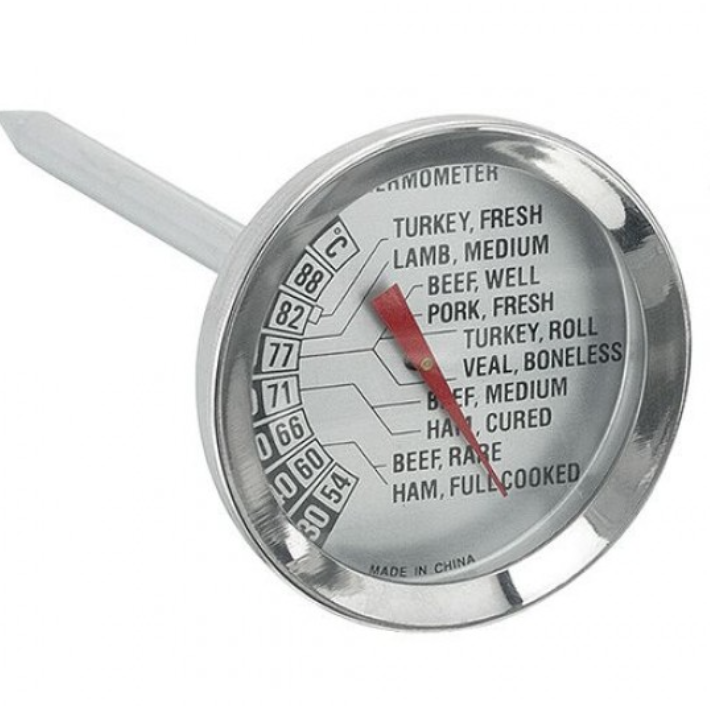 Calculate the cooking time according to the guide below. Arrange your oven shelves so that the meat will be positioned in the centre of the oven. Preheat your oven to the correct temperature before you put the joint in, to ensure your cooking time is accurate. With larger roasting joints it’s a good idea to cook them for the first 20 minutes on a high heat, to let the heat penetrate the meat and give a good crispy skin on the outside (there’s no need to use this method if you’re slow roasting a shoulder joint). If you are going to do this, preheat the oven to 220C/Gas 8. Remember to reduce the temperature after 20 minutes and deduct the 20 minutes from the total cooking time. You can leave the oven door open for a couple of minutes to help it cool down. 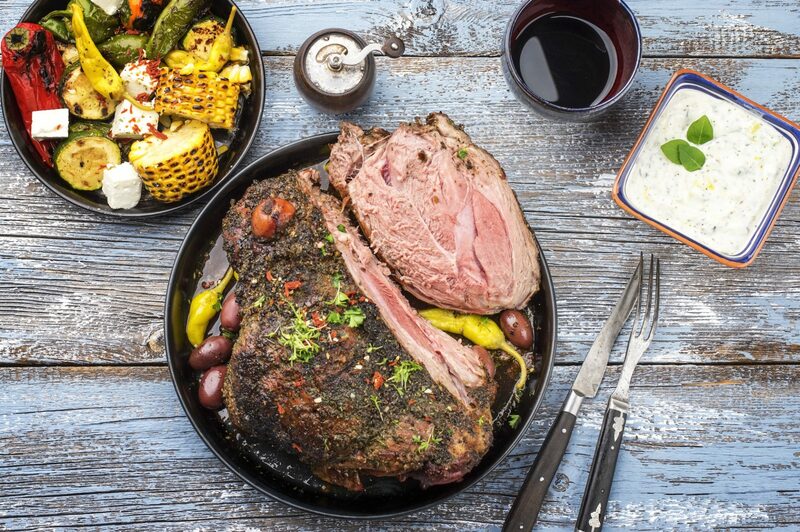 There’s no need to cover a leg of lamb with foil while it roasts. Due to the longer cooking time of slow roast shoulder, it’s a good idea to cover it with foil to help retain moisture. Take the foil off for the last 30 minutes of the cooking time to let the skin crisp up. Its good to basting the meat while it cooks too. This helps keep the meat moist, and adds flavour. Simply spoon the juices from the roasting tin back over the meat. Take the roasting tin out of the oven and tilt the tin slightly so that the fat and juices collect in one corner. Use a spoon or turkey baster to scoop them up and drizzle them over the meat. Baste the lamb 2 or 3 times while it’s cooking, and remember to shut the oven door so you don’t lose heat. Slow roast lamb will be cooked through and slightly falling apart due to it’s longer cooking time, so the rules of medium, medium rare and well done don’t apply. 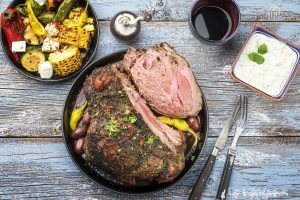 We think a roast leg of lamb is at it’s best served medium, but follow the roasting time guide to help you cook it how you like it. When the cooking time is up check your lamb by piercing the thickest part of the joint with a skewer. If the juices are pinky-red, the meat will be medium-rare. Slightly pink and it’s medium, and if you want it well done, they should run clear. 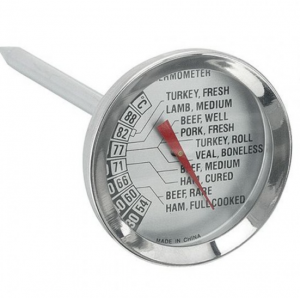 A meat thermometer is very useful for large joints. Push the probe into the meat as close as possible to the centre (avoiding any bones) and leave it for 20 seconds before taking the reading. Medium should read 60C and well done 70C. 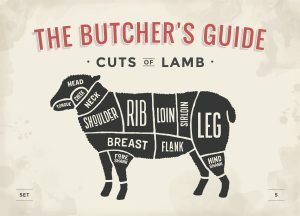 Just like beef, lamb needs to rest after cooking, to allow the juices to ‘settle’ back throughout the meat, making it juicier and easier to carve. Transfer your lamb to a warm serving platter or clean board and cover with foil to keep it warm. Leave to rest for 20 minutes, before carving. A small rack of lamb will only need 5 minutes resting.